Large, soft and the perfect color grey for my decor. 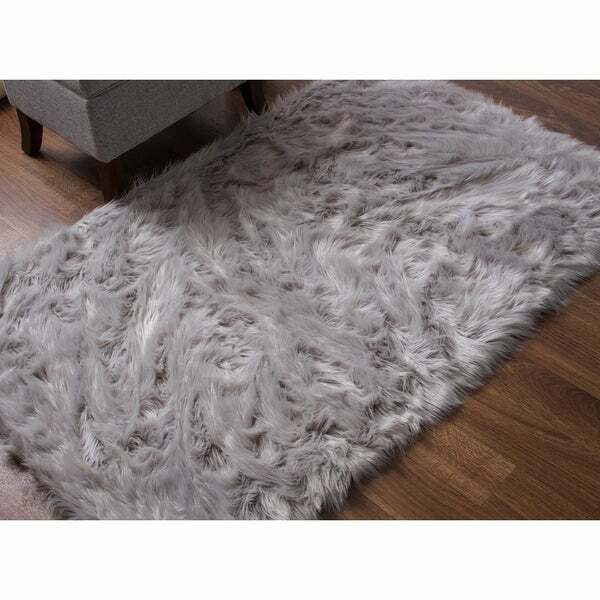 This faux fur area rug is made of real sheepskin and features a particularly soft velvety feeling that is an absolute delight to step on. Top quality acrylic yarns make it impossible not to be cozy and delightful to the touch. The rug feature a 2.5-inch silky pile done on a faux suede backing that is skid resistant. This attractive piece will make for a great addition to add texture to any room from living rooms to nurseries. Dimensions 84.0 In. X 60.0 In. X 2.0 In. I’ve purchased rugs before on this website and have been satisfied but not with this rug. I had just recently remodeled daughters room with pastel pink colors and was hoping this rug would fit right in but when product arrived it was a peach color. Nothing what I was hoping. Very silky, soft, furry rug. It does shed if you try to pull the hairs out so be careful. Color is slightly darker than dove and lighter than charcoal. Feels very plush on my feet. Overall, pretty nice rug. I love the quality of this rug, especially for the price I paid. It's so soft! This was exactly what I wanted, although, it was darker than I expected. My sister complimented on this rug several times, which says a lot. (She doesn't really compliment much on anything). Highly recommended! This rug is so soft! My only complaint is that I wish it came in a larger size. The color is exactly as pictured. Great price for the value. Wow! Bought this for my Daughter’s glam bedroom suite. Feels incredibly soft to walk on. She likes to lay on the floor and listen to music - guess what her new favorite spot is! Yup, this rug. Great color - true to pictures in the website. Thinking about buying one in white for my closet. This thing is fuzzy! It is very light weight but stays in place well. I like the color and texture. I wish I had gotten a bigger size. For the price this was worth it. The color is perfect and feels great! Seems bigger than it is. Was so pretty I was amazed of the quality n how beautiful it was very soft lined backing I just at a loss for words how ever I would recommend this to all of my friends! Perfect addition for my daughter's bedroom! It makes her bedding and is so soft! She loves laying on it and drawing pictures or reading a book. I will definitely be looking for more products from this company! Gift for pre-teen and she loves it. Good quality and price. "The first sentence says “his faux fur area rug is made of real sheepskin”...so which is it? Real or faux?" The rug is made from Faux fur. Gift for my niece per her request! It had the color brown that I was looking for.